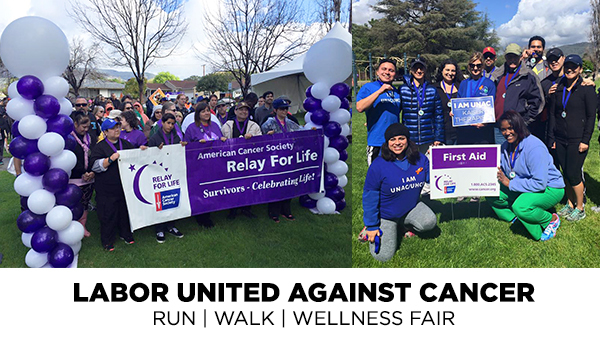 Join UNAC/UHCP and Kaiser Ontario Vineyard Health Care Professionals Association (KOVHCPA) on Saturday, March 4 as we walk in solidarity with other labor unions against cancer. Relay For Life is the signature fundraiser for the American Cancer Society. Join UNAC/UHCP to remember loved ones lost, honor survivors of all cancers, and raise money to help the American Cancer Society make a global impact on cancer. Wear your UNAC/UHCP blue and bring your family and friends! If you have children that need volunteer hours, or have any questions/concerns, please email Olivia Guevara at Olivia.Guevara@unacuhcp.org All are welcome to attend!